From out of the Stygian Haunts of Hell it came — and, with a sloshing plop, arrived in our midst, where it has remained ever since as (to quote the text) “a dark red blotch upon the face of the earth, blotching things up.” Here, at no cost to anyone, for absolutely free (and it would be cheap at twice the price) is the immortally bad and possibly worst story ever, THE EYE OF ARGON, as you’ve never seen it before — but will from now on. (We’re not sure what that means, but it sounds good.) 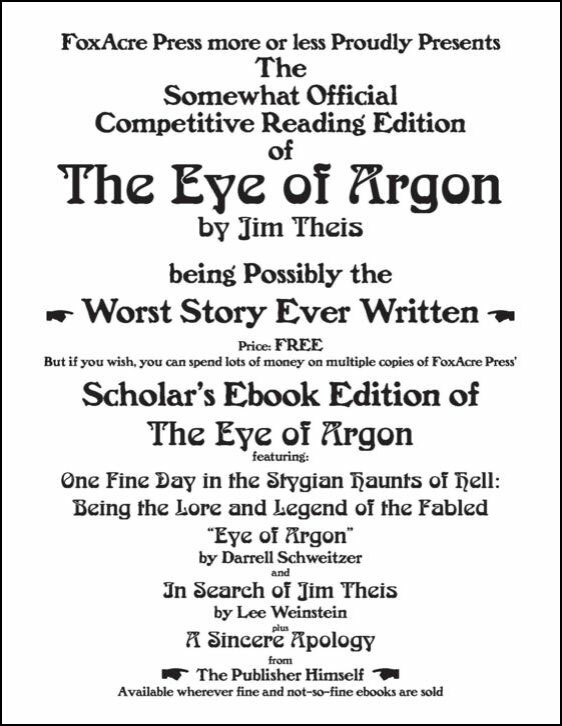 This is the only edition suitable for downloading and printing that reproduces, word for word, line by line, page by page, the exact layout of the godawful original — including the remarkably bad illustrations without which the THE EYE OF ARGON is to a certain degree less complete than it otherwise would be. 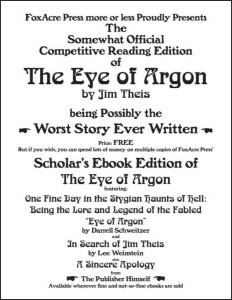 This Somewhat Official Competitive Reading Edition at long last brings standardization and a level playing field to the cut-throat world of Competitive EYE OF ARGON Readings. Now competitors can be sure that everyone is literally on the same page, and that they are reading from a text that is as near as dammit to the original. Bad typing, murky-grey type, scratched-out text — all of it is simulated in relatively high fidelity for your enjoyment, if that’s your idea of a good time. Includes a handy chart of what pages were what colors in the original, so you can print your copy on the very same Malevolent Orange paper stock as seen in the primordial edition. Also includes the somewhat official rules of the game.